Safety is at the core of our entire business and keeping our employees and customers safe is our top priority. That means making sure you are well-informed. If you use propane, please take a few minutes to review the safety Q&A below so you and your family know how to respond if there is ever an emergency. Propane (also called LPG – liquified petroleum gas or LP gas) is a liquid fuel stored under pressure. In most systems, propane is vaporized to a gas before it leaves the tank. Propane is flammable when mixed with air (oxygen) and can be ignited by many sources, including open flames, smoking materials, electrical sparks, and static electricity. Severe freeze burn or frostbite can result if propane liquid comes in contact with your skin. Propane smells like rotten eggs, a skunk’s spray, or a dead animal. In some instances, propane can lose its odor so you should respond immediately to even a faint odor of gas. If you smell gas, make sure there are no flames or sparks around. Do not operate lights, appliances, or phones (landlines or cellular). Leave the area immediately. Shut off the main gas valve by turning it to the right (clockwise). Call us right away to report the leak from a neighbor’s home and or get a safe distance away. Call 911 or your local fire department. 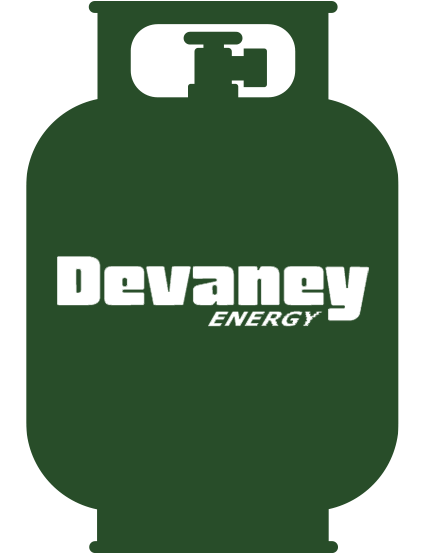 Do not return to the building without getting the clear from Devaney Energy, a qualified technician, or emergency responder. We have a safety brochure available that has a scratch and sniff similar to that of propane. Please call our office at 866.964.8383 to request one. What should you do if you suspect CO is present? Act immediately! If you or a family member shows physical symptoms of CO poisoning get everyone out of the building and call 911. If it is safe to do so, open windows to all entry of fresh air, and turn off any appliances you suspect may be releasing CO. If no one has symptoms, but you suspect CO is present, call your local fire department. Then, call us to send a technician over to check your propane equipment. If your pilot light goes out, please call us at 866.964.8383. If you run out of propane gas, call us immediately at 866.964.8383 to schedule a leak check before turning back on the gas. At any time you have any questions or are unsure of something, please call our office at 866.964.8383.